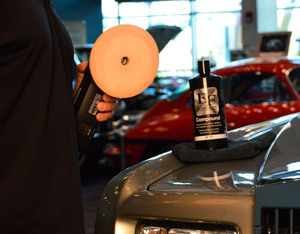 Hand application - Apply with a dense foam applicator or microfiber applicator. Mist clean pad with pad conditioner. Apply a nickel-sized amount of Compound onto applicator. Work on a 2 x 2 sq. ft. area. Wipe compound over paint using short, firm strokes until polish starts to turn clear. Wipe off immediately using a microfiber towel. Machine application - Wok on a 2 x 2 sq. ft. area. Mist a clean foam cutting pad with pad conditioner. Apply an X of compound onto the pad. Spread the compound over one section with the machine turned off. Set the speed at 5-6 on a dual action polisher or 1,200 - 1,500 RPM on a rotary polisher. Work the compound over the surface using moderate pressure until it begins to turn clear. Buff of compound by hand using a microfiber towel. Related Items - BLACKFIRE Polish 128 oz.